OK here's my last photo of the baby boxie pen. Got it right spelling of pin should pen at any rate this a view of the pen I keep the three babies from August of this year and the other baby who is 1 year and 4 months old. They will drink water but will not eat through the winter months. Their pen is in our family room and the average temp is about 68 degrees all winter. For bedding I have a layer of earth dirt and spagnum moss which I keep lightly moist. 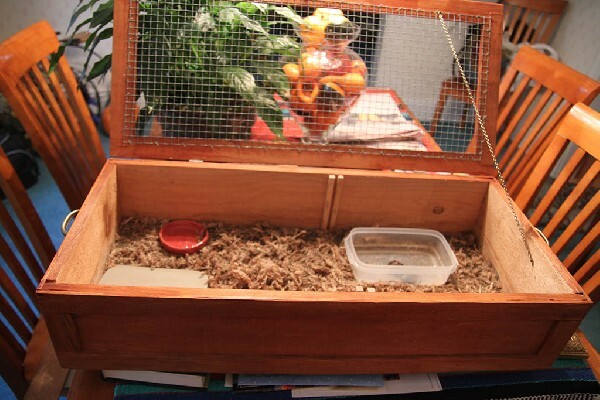 The pen is about 18 inches by 24 by 4 inches deep I can close the lid with a screen top and put a 40 watt bulb for a hint of heat should the winter get very cold.